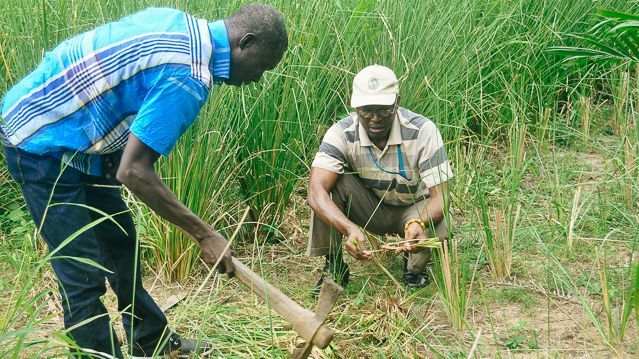 UNU-INRA researchers uprooting vetiver grass for studies. Photo: Gessesse Dessie, UNU-INRA. The world is witnessing a water quality crisis, mainly brought about by rapid population growth, industrialization, food production practices and poor water use strategies. As population increases, so does wastewater output. And in developing countries, about 90 percent of all wastewater is discharged untreated directly into rivers, lakes and oceans. The impact of wastewater on the environment and human health is not only striking but frightening. A report by the United Nations Environment Programme (UNEP) and UN-HABITAT in partnership with members of UN Water indicates that two million tons of sewage, industrial and agricultural waste are discharged into the world’s waterways and at least 1.8 million children under five-years-old die as a result every year. That is one child lost every 20 seconds due to water related diseases. Inadequate infrastructure and lack of financial resources are largely to blame for the wastewater menaces that plague most developing countries, especially their cities. In these countries, septic tanks receive the faecal waste of most urban dwellers, while other household liquid wastes are directed into the nearest drains. Because drainage system costs are frequently prohibitive, the majority of urban drains are open, lending themselves to misuse and sometimes serving as defecation points for households without adequate sanitation facilities. 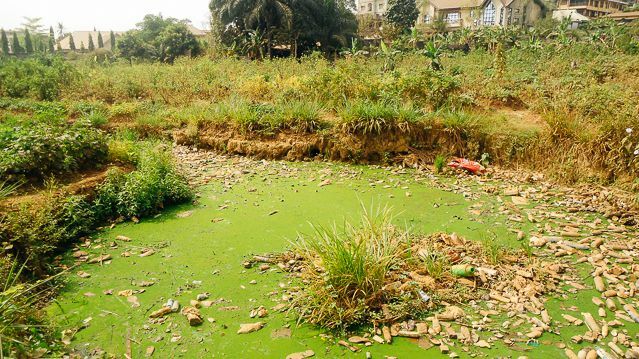 Industrial wastewater — from breweries and other sources such as the textile, mining, chemical and pharmaceutical industries — is usually discharged into these open drains or into water bodies without any pre-treatment, posing health hazards. An urban wastewater drain. Photo: Effiom Oku, UNU-INRA. Managing wastewater in an efficient and sustainable way calls for a multifaceted approach. Various measures including behavioural change approaches towards combatting water pollution and the use of appropriate infrastructure, technologies and techniques will help reduce the impact of wastewater on the environment and on humankind. The quest for an immediate approach to wastewater treatment in developing countries has spurred research within the scientific community. Among that research is a project being carried out by the United Nations University Institute for Natural Resources in Africa (UNU-INRA) in partnership with Ebonyi State University in Nigeria. The project is assessing the potential of an African vetiver grass species, Chrysopogon nigritana, in treating industrial effluents and wastewater from domestic origins, which have been major sources of contamination. 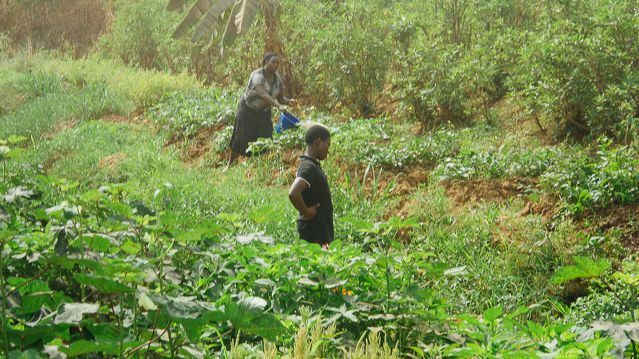 In Africa wastewater is increasingly becoming an important resource for various uses including irrigation in urban and peri-urban agriculture. This wastewater is often high in toxic heavy metals including arsenic, cadmium and manganese as well as components of nutrient pollution such as phosphates and nitrates. A farmer irrigates food crops with wastewater. Photo: Effiom Oku, UNU-INRA. The general findings of this vetiver project reveal that Chrysopogon nigritana can reduce these contaminants in industrial effluents and domestic wastewater. For example, in one case, samples were taken of leachates from a dumpsite and treated with Chrysopogon nigritana for seven days. Laboratory analysis of the chemical properties of the treated leachate indicated that phosphate, which was at a pre-treatment level of 92.9, was reduced to 19.71 mgl-1, while Chemical Oxygen Demand (COD) dropped from 151.78 to 50.57 mgl-1. These levels are far below the United States Environmental Protection Agency’s (USEPA) permissible limits of 50 and 75 mg l-1 for each of these respective chemical properties in water. Similarly, laboratory results showed that arsenic and cadmium properties, which were both initially at pre-treatment levels of 0.2mg l-1, were completely removed from sample effluents taken from a fertilizer company after a six-day vetiver grass treatment. The absence of these chemical properties after treating the effluents with vetiver grass is very satisfactory because the World Health Organisation/Food and Agriculture Organisation’s (WHO/FAO) acceptable levels for arsenic and cadmium in water are 0.10mg l-1and 0.005mg l-1 respectively. Additionally, analysis of a sample of slaughterhouse wastewater treated for seven days by vetiver showed an 88 percent reduction in manganese (from 1.03 mg l-1 to 0.12 mg l-1) — a reduction well below the WHO/FAO’s safety standard of 0.20 mg l-1 for manganese in water. Dr Effiom Oku, Senior Research Fellow for Land and Water Resources at UNU-INRA and the research project’s manager, explains that the results are significant and offer many developing countries, including those in Africa, a unique window of opportunity for reducing the impact of wastewater on human health. Dr Oku noted that heavy metals such as arsenic can cause cancer of the skin, lungs, liver and bladder and exposure to high levels of metals like cadmium can severely damage these organs and ultimately cause death. He added that the use of untreated wastewater for crop irrigation affects not only human health but that cattle grazing on pastures irrigated this way can become heavily infested with the larval stage of the tapeworm (Taenia saginata). “Irrigation of edible crops with untreated wastewater can result in the transmission of various infections including intestinal nematode and bacterial infections for both the consumer and the farmer as a result of the heavy metals in the wastewater, and the ability of the African species Chrysopogon nigritana in treating these domestic and industrial contaminated liquids will help reduce the health implications of consuming these crops among consumers,” explained Dr Oku. After growing in soil for about 12 weeks, the mature vetiver grass can be dug up and separated into individual plants. The roots are then trimmed and the shoots are pruned to about 15-20 centimetres. The grass is then transferred to a “floater”— a planting device that will allow the grass to float on the surface of water . The water has to be supplemented withwith nutrients such as fertiliser, cow dung or poultry waste (hydroponic agriculture). The plants are allowed to grow in their floaters for another 8–12 weeks before being transferred with their floaters to the wastewater in need of treatment. The plants are left in the wastewater to grow and the roots and leaves are periodically pruned. Dr Oku explained that once the vetiver plants are put in the wastewater, the grass will start removing the contaminants in the water through the roots to the leaves, hence the need to prune the roots and the leaves regularly. He added that, “this is a green technology that leaves behind no carbon footprint since it does not use conventional energy” such as oil, gas or coal. Dr Elias T. Ayuk, the Director of UNU-INRA, also speaking on the relevance of the research, acknowledged that future demand for water cannot be met unless wastewater management is revolutionized. He explained that in its role as a natural resources management think tank of the United Nations and its member states in Africa, UNU-INRA conducts studies such as this one to help inform policy formulation and implementation. The resulting research findings, he said, will help direct efforts towards the judicious use of natural resources for development. Indeed, the development of many countries will depend on investment in sanitation and water treatment. As revealed in the UNEP report, every dollar invested in safe water and sanitation has a payback ranging from US$3 to US$34 depending on the region and the technology deployed. It has therefore become imperative to meet wastewater management challenges with cheaper technologies like the vetiver grass option to ensure a healthy environment and sustainable development. This article summarizes work carried out on the United Nations University Institute for Natural Resources in Africa’s (UNU-INRA) research project: Potential of an African Grass Species in Healing Industrial and Domestic Sickwater. You can contact UNU-INRA for more information on the application of the vetiver technology in treating wastewater.